Product review: Too much choice – by Adam Marshall, 22 Aug 15 5/5 Excellent "Very easy to book, the choice of dates and locations were so many you didn't know what to choose! The directions where a little confusing but other than that the facilites where good. The staff where very freindly and welcoming. The equimpent was good but very old and worked. The breifing was informative and made you feel confident and safe in what you were about to do. The experiance was very exciting and gave me a feeling of joy. I deffinetly would do it again and would highley recommend it to a freind. I was given time to take photos and time to hang around. It wasn't realy like you where rushed to leave! " 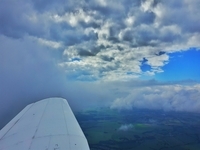 On arrival you will be introduced to your Flight Instructor and have a short briefing to discuss the route that you wish to follow (subject to time constraints, weather conditions and local airspace restrictions). Once airborne you will have opportunity to take the controls and experience the thrill of flying for yourself under the supervision of one of our Flight Instructors. Once in the aircraft you will be guided through each stage of the flight, with your instructor talking you through the take-off and landing. You will fly over some of the beautiful Yorkshire and Lincolnshire countryside that surrounds Robin Hood Airport with the chance to take some amazing photographs to capture the moment forever. As you will be flying in our larger 4 seat aircraft, you may bring up to 2 passengers to share the experience with (weight limits apply). Participants must be over the age of 12 to fly. Passengers must be over the age of 3. First Avenue, Doncaster DN9 3RH. Very easy to book, the choice of dates and locations were so many you didn't know what to choose! The directions where a little confusing but other than that the facilites where good. The staff where very freindly and welcoming. The equimpent was good but very old and worked. The breifing was informative and made you feel confident and safe in what you were about to do. The experiance was very exciting and gave me a feeling of joy. I deffinetly would do it again and would highley recommend it to a freind. I was given time to take photos and time to hang around. It wasn't realy like you where rushed to leave!